Calgary Cascades defeated Edmonton Tigers in the playoff final. Back in the league after an absence of 12 years, Chamberlain took the Basin championship. Fans in Southern Saskatchewan were treated to some outstanding pitching. Don Krick set the stage with two incredible efforts out of the gate. On May 25th, the Yorkton lefty fanned 20 in a 1-1 tie with Regina. The next time out, May 28th, he ran up 18 strikeouts as he came within one out of a no-hitter. The import from California college ranks finished with a 9-0 record in 11 starts, 10 of them complete games (including a tie). Roy Rowley fired a one-hit shutout June 27th as Moose Jaw topped Swift Current 2-0. Fred Cardwell had a one-hit shutout on July 3rd in a 4-0 Regina victory over Melville. July 23rd, he allowed just two baserunners in a 10-inning scoreless tie with Yorkton. Then there was Dale Hogg. On June 23rd he gave a hint of what was to come with a three-hit, 14 strikeout performance in an 8-0 regular season win over Yorkton. In the playoffs, he pretty well carried Moose Jaw Regals to the championship. August 17th it was a three-hit shutout over Yorkton and a week later another three-hit blanking as Moose Jaw again topped Yorkton. August 27th, the right-hander blanked Regina on five hits and September 1st he was the winner, with a five-hitter, in the deciding game of the playoffs as the Regals took the title. And, perhaps at the front of the highlight reel, featuring both pitching and hitting performances, was Rowley. At the Lacombe Lions Baseball Tournament he was the hero for Moose Jaw as he drove in the winning run as the Regals beat Unity in the tourney final. In their opening game, Rowley had knocked in the winner as Moose Jaw beat Saskatoon Commodores. In the semi-final, the right-hander was the winning hurler against North Battleford and batted in the winning marker. In the Northern Saskatchewan League, Ron Fyfe of the Saskatoon Commodores finished with a remarkable 0.84 ERA in 64 innings of work. Howver, it was the North Battleford Beavers as the class of the Northern Saskatchewan League, winning the pennant with a 22-7 record and going on to claim the league title downing Unity in the final playoff. Lloyd Haddon (right) was the star of the 1968 Peace River tournament clubbing a record six home runs. Haddon, a former hockey star with the Edmonton Flyers, playing for the Beaverlodge Royals, also drew	four	intentionally walks. In the second year of the Alberta Major Baseball League, the Calgary Cascades, fourth place finishers during the regular season, got hot at the right time and won the league championship with a victory over Edmonton Tigers in the playoff final. Saskatchewan's Mid-West League featured two no-hitters ! 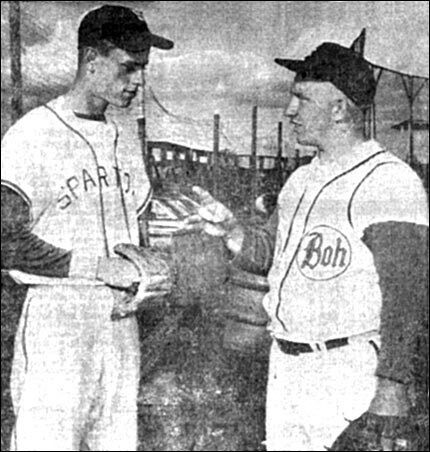 On June 9th, import hurler Bob Burchfield of Eston Ramblers held Saskatoon T-Birds without a hit in a 6-2 victory in the first game of a double-header. The runs against him scored on a wild pitch and a bases-loaded walk. He fanned 14 of the 27 batters he faced in the seven-inning contest. He walked four, three of them in the third inning. Burchfield finished the season with a 6-0 record, best in the league. June 27th, Asquith lefty Murray Eddy fired a no-hitter in an 8-0 with over Rosetown. 1968 - 18 year old pitcher Dave Pagan of the Nipawin Lawnmasters (wearing his Snowden Spartans' uniform), a pick up by the Prince Albert Bohemians for Saskatchewan provincial playoffs, talks over strategy and signs with catcher Gord "Squeak" Nelson prior to the start of a game played July 19, 1968. The Bohs (named after Saskatchewan's best selling beer of that era) triumphed to win their best-of-three quarter-final series in two straight games. Pagan went on to a ten year pro career after being signed out of Bellevue Community College by the New York Yankees in 1970, making his major league debut with the Bronx Bombers in Yankee Stadium on July 1, 1973.